Neil Young wants to bring music back to where fans can listen to every cymbal strike, every guitar strum, every echo thought up by a musician, according to USA Today. His kickstarter campaign for his high fidelity music player and online store Pono surpassed his goal of raising $800,000. As of 8 a.m. today 3,852 backers have pledged $1,267,213. “Everything you know, cameras got easier to use, everything went up, everything went up but music went down,” he said during his 30 minute speech at South by Southwest on Tuesday. 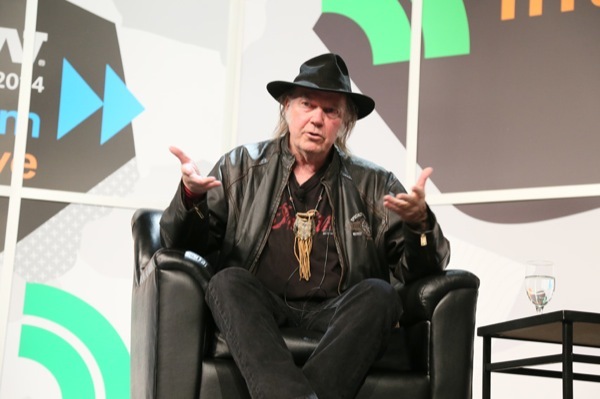 The future of sound one day soon could be contained in a candy bar-size receiver that sits on a breakfast counter — a new music initiative he’s launching named PonoMusic, the legendary rocker told an audience of several thousand attendees at SXSW on Tuesday. Young appeared in signature black leather jacket and black hat, and paced back and forth across the stage as he described the new technology. He had been working on the high-resolution music project for more than three years and has decried the state of digital music in the past, particularly in his book, Waging Heavy Peace. Can Pono beat the convenience of streaming? Do people want quality over quantity or convenience? What we do know is Neil is always lending his creative genius to world and that is good for all of us.